T-shirt templates are a great help when we first start to design our very own garments. Below, you’ll find 100 of some of the best mockups we were able to find online. 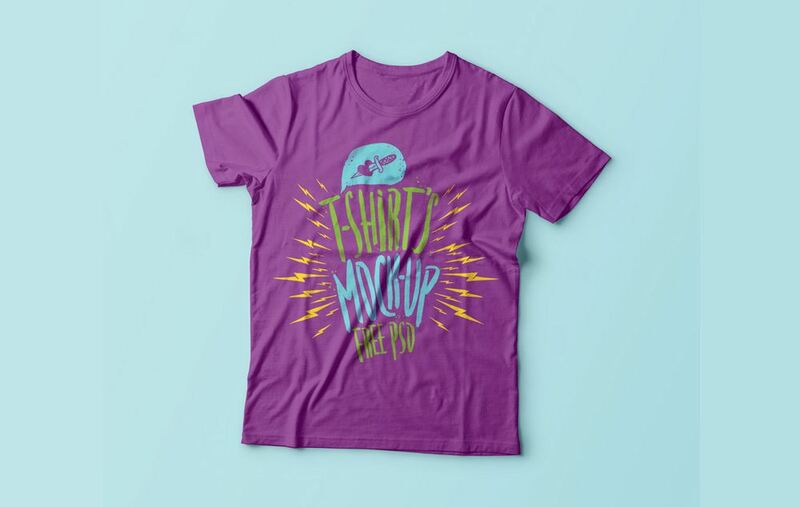 If you’ve never used a T-shirt template before, then we suggest you head over to our blog post ‘How to use a T-shirt template on Photoshop’ where we explain the basics. We offer a few mockup bundles for professional and amateur designers. This is exclusive content created by Printsome designers for our blog readers. Our men’s apparel garment bundle not only offers T-shirts but also hoodies, sweatshirts and polo shirts. This is a mockup that features a model wearing the garments in front of beautiful backdrops. In the zip file, you’ll also find a PDF guide that will teach you how to use the mockup. Our women’s bundle is similar to the male one. It offers different mockups where a female model wears T-shirts, hoodies, polo shirts and more with beautiful Barcelona as a backdrop. It also comes with a PDF that teaches you how to use it. In case you prefer the look of a garment on a hanger, we also offer the T-shirt and jumper mockup. This bundle features real pictures of T-shirts, sweatshirts and hoodies in front of editable backgrounds. Sometimes we don’t like and/or need to download files from strange sources on the internet which is why online template can be the perfect solution. While you may not get the same quality as a PSD file, these generators can get the work done in little time. This generator allows you to create professional looking mockups in a matter of seconds. Its interface it’s easy to use and offers many different kinds of garment images, from folded tees to models in all shapes and sizes. Cost: Goes from $12 for a simple plan to a $199 plan that includes videos. PlaceIt is offering a special offer that’s exclusive to Printsome readers. All you have to do is follow this link to get 15% off your PlaceIt plan! CustomInk offers an online T-shirt mockup experience for those who don’t necessarily wish to download a file from the internet. It is easy to use and allows you to save your mockup once you’re finished. This platform may not be the most modern-looking but it is very intuitive. This file generator by Printful is a great solution for a quick mockup. It is quick and easy to use. Much like DeviantArt, Behance is a place where artists and designers can showcase their portfolio. A simple T-shirt mockup brought to you by this young Russian designer. Remember to credit! A simple template that features a model wearing a T-shirt. You can change the appearance of both the tee and the wall. This cool looking T-shirt template is brought to you by Vayn studios. Is completely free to use, but make sure you send them a thank you note! Creative Market is a platform designed to help independent designers with tools such as templates, fonts, website themes and many more. This beautiful mockup by Creative Market comes with some modern textures but you can swap them with any colour and design you want. They even have a video that teaches you how to use it! This is a collection of various T-shirt templates. 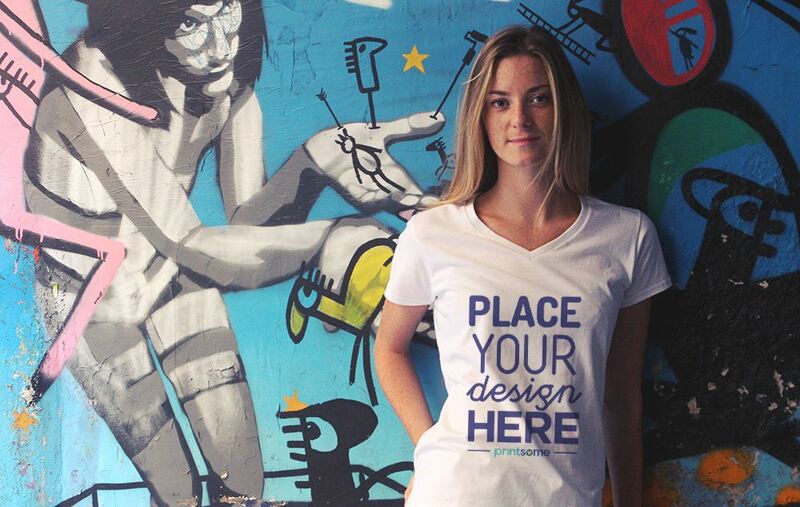 What’s cool is that you can see your design on a T-shirt alone or on the model. You can get the women’s mock-ups, too. This bundle comes with 16 different mockups of female apparel. They feature two models in an urban setting. Cotton Bureau offers some great colourful T-shirt templates for download. The only trick is that these high-quality T-shirt templates will set you back a few quid. This is a platform for artists and designers to show their work but some of them also like to design resources for others to download. Here are some of their best T-shirt templates. Grab this great 300 dpi JPEG file from a Deviant Artist. It’s great because it’s just a simple set different positions of a black T-shirt. Cost: Free, but try to donate a quid! She’s got T-shirt designers covered, that’s for sure. If you need T-shirt templates that take into account a range of vector colours, look no further. She based these templates on American Apparel’s Medium tee. Drop her some cash in her PayPal! Here’s another template by Angela Acevedo. This time around the designer brings us a simple white T-shirt’s high-quality JPG – not a PSD. But it’s got a folded version! This mockup is 100% free, easy to use and comes with instructions and an example. Remember to drop them a comment and thank them! This long-sleeved T-shirt mockup is free to use and allows you to manipulate highlights, shadows and colours. Remember to leave him some feedback and a thank you note once you’re done using it. TheApparelGuy brings us another template through his DeviantArt profile in the form of a woman’s scoop tee. The button V-neck is not a regular garment, but it’s still good to have the option. This is yet another mockup by TheApparelGuy. This template is brought to you by GrahamPhisherDotCOm and as they say it, it’s “100% free and 100% customisable”. TheApparelGuy comes to the rescue again with a brand new T-shirt template. This one features customisable colours, artwork mask layer, photorealistic shadow and highlight Layers, front and back sides, and a modifiable Tag. Yet another template by TheApparelGuy. This one is for ringer T-shirts. If you like this particular kind of T-shirt then this is the mockup for you. A nice mockup PSD file of a “ghosted” T-shirt. If you happen to design several kinds of lady garments then chances are you’re using at least one kind of crop top. If that’s the case then don’t look further than this template. This mockup was originally designed to be used at a DeviantArt group and therefore don’t know if it can be used for commercial purposes or not, but you can always ask. Simple vector design which features front and back sides and a headless silhouette of a model. This vector template by GoPurifyYourself contains both Ai and PSD files. This young designer brings us a collection of garments in one package. Tees, hoodies and even silhouette illustrations of models. A useful vector of a white T-shirt for all of your wonderful creations. The DeviantART designer created a straight-to-the-point mockup of male and female T-shirts. It includes front and back side views. A template of a white T-shirt. Leave a comment for the designer so they can improve their skills! This PSD vector file comes with three different T-shirts: white, black and coloured. You may also modify the size of the garment to fit your needs. The following feature not only one but many templates and different resources that will help you in your design path. Talk about high-quality T-shirt printing services: Aura’s templates are comprehensive and are not limited only to T-shirts: you can find printed bag templates, personalised hoodie templates, and long-sleeve shirt templates. For all you designers out there, here are some T-shirt templates with models (male and female) and a variety of different T-shirt colours. 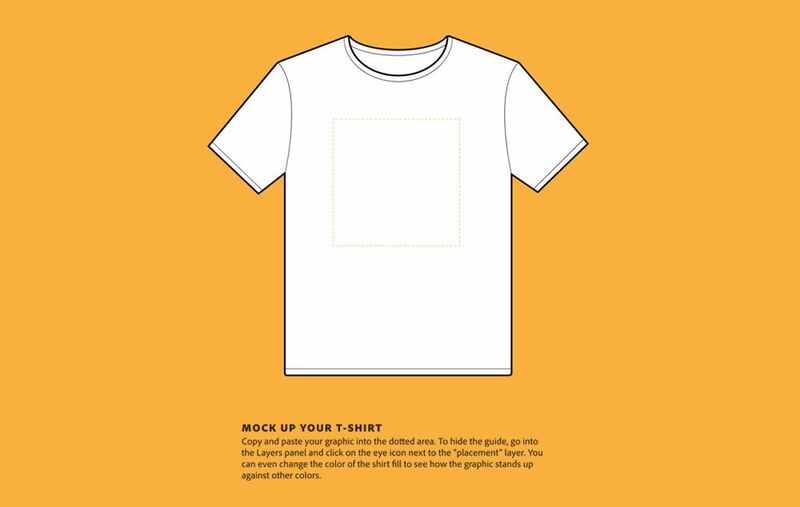 While you’re over there, be sure to check out their cool T-shirt printing guide. Go here to download directly an easy-to-use PSD file for multiple T-shirts. 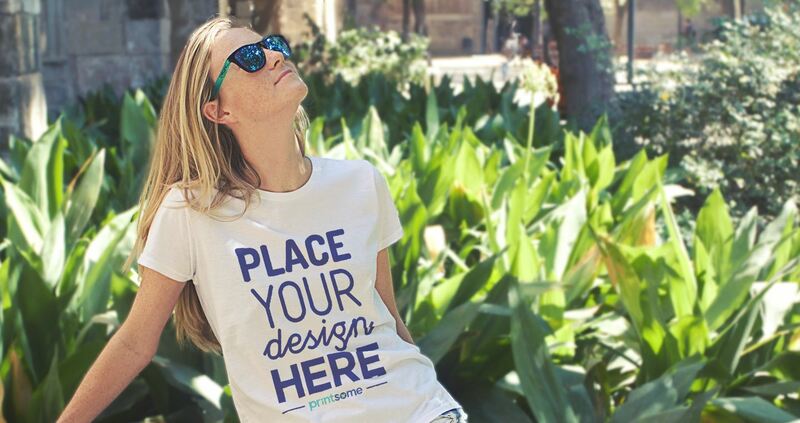 Add your printed T-shirt logo and presto! This is a great way to visualise, for example, your next promotional T-shirt. This is a great option for designers who want to see their work on a realistic surface. It’s a PSD file, but you’d think your T-shirt was already printed. This is the best T-shirt template. Not only does Threadless offer a high-quality T-shirt mockup, but hoodies, jumpers, tanks and even wall art, as well! Not exactly a mockup, but still useful. Randy offers a wide selection of blank T-shirts in different colour options and positions. Graphiceat offers a great variety of T-shirt templates for all occasions. A collection of four high-resolution mockups of T-shirts for both men and women. Unlike most templates in this list, the file presented by Freepik is a vector and therefore doesn’t have any pixels. Which means you can expand it to any size you want without worrying about image damage. A useful vector T-shirt mockup that allows you to customise it in whichever way you see fit. This template is made of a fully editable layered PSD. You can change the colour, design and background. Over at Real Thread, you’ll find all kinds of tools to help you on your T-shirt design journey. From tag templates to ink colour lists and background images for visual proofs, there’s something for every step of the T-shirt printing process. Cost: Free but you must enter an email to download. This site offers a great variety of simple T-shirt templates and the best part is that they’re all free! This template does not offer a lot of options but that may be a positive thing. If you need a simple vector of a blank T-shirt, then this one is for you. 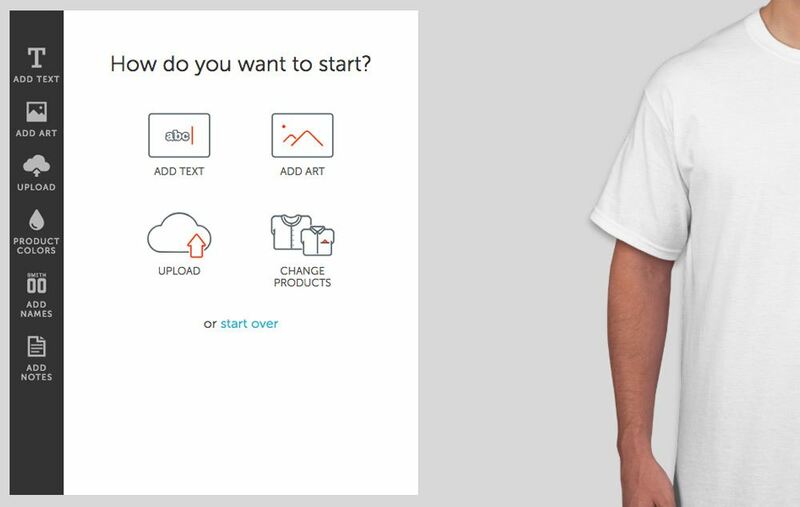 ThreadBird offers two simple templates for T-shirts of different sizes. Standard screen size and jumbo screen size. Studioweeber brings us a selection of male and female T-shirt mockups and if it wasn’t enough, they also threw in a couple of tote bag templates, as well. Mockup Everything stands true to its name and offers a great variety of pieces. 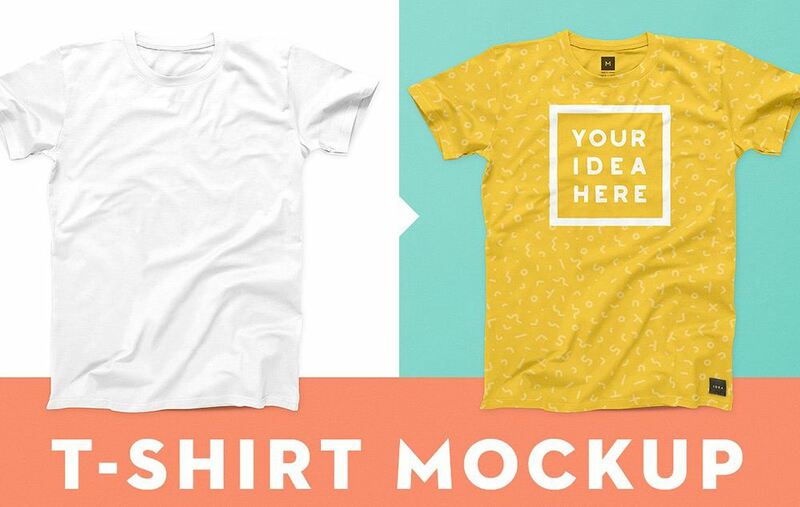 For $4.99 each, you’ll be able to download mockups for anything from a T-shirt to high-heeled shoes. Vecteezy offers a great variety of mockups. Some of them are simple 2D vectors while others feature more realistic illustrations. Some templates are Free to download but require attribution while those that include a license can only be obtained by paying for download credits. At Event Elements, you’ll find all sorts of tools for your graphic design needs. Among their T-shirt templates, there’s a great variety going from files with models, T-shirts on hangers and simple 2D vectors. As you may already know, Shutterstock is EXPENSIVE but they do have far more options when it comes to T-shirt templates than any other site. You can find just about any kind of mockup you can imagine in here. Cost: They have different packages depending on your needs but it can go from €29 to €579 a month. Much like Shutterstock, iStock offers a great variety of templates. They don’t have as many options though but it is a bit cheaper. Cost: They’ve got different plans starting at €24 for 3 credits to €380 for 60 credits. For those of you who prefer to work with vectors, these are the templates for you. This template comes not only with a T-shirt, but also polo vectors. It also features silhouettes of male and female models. This template of a blank T-shirt comes with a total of 40 base colours inspired by American Apparel products. These are the bare essentials of a T-shirt mockup but you’ll have to use it if you want to sell your merchandise on Amazon. Also, props to Amazon for making a GIMP version so those who don’t own Adobe can also use it. This template offers four different kinds of T-shirts. Crew straight, crew wrinkled, scoop and V-neck. If you’re not certain about downloading a template from a sketchy site, we don’t blame you. This is why would like to point you towards Adobe’s files. This is a big company so you know there’ll be no problems when downloading from them. 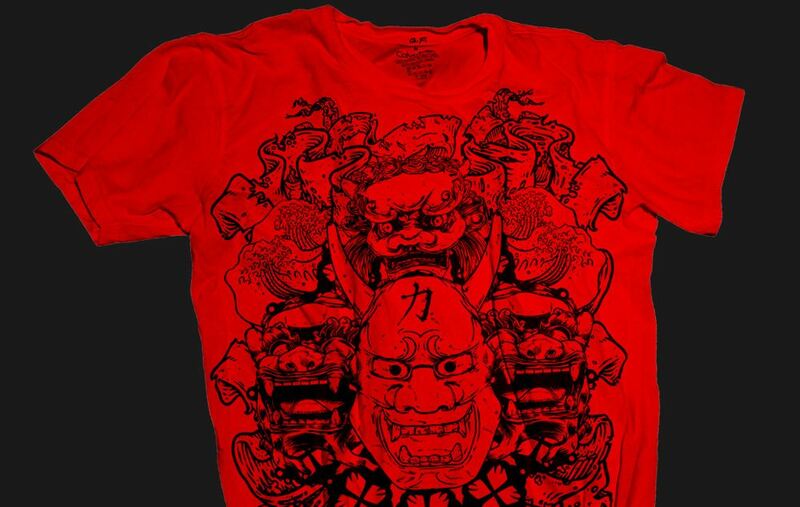 This T-shirt does not have a realistic outline but it does have some interesting textures. Most people will probably prefer a more ‘real’ shape but this is a good option for those looking for something a bit different. 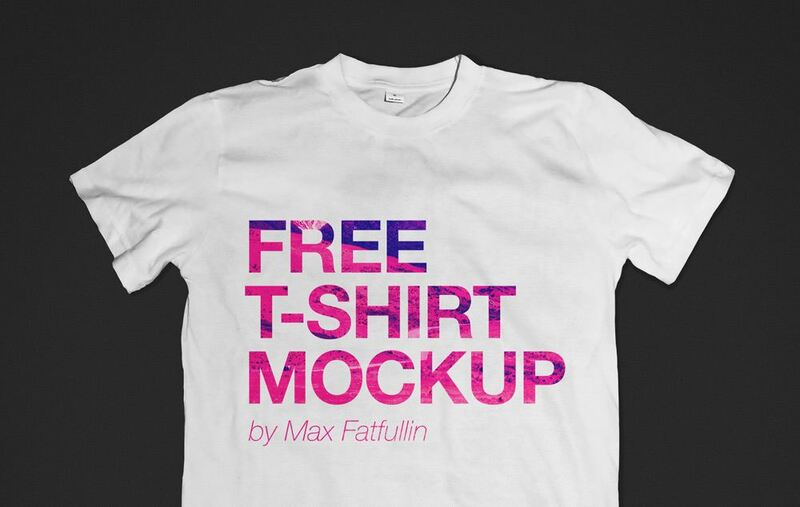 To celebrate the release of their Ultimate Vector Pack, Prepress Toolkit released this free T-shirt mockup. If you’ve got $39 to spare, you may want to buy their full package which includes all kinds of garments. 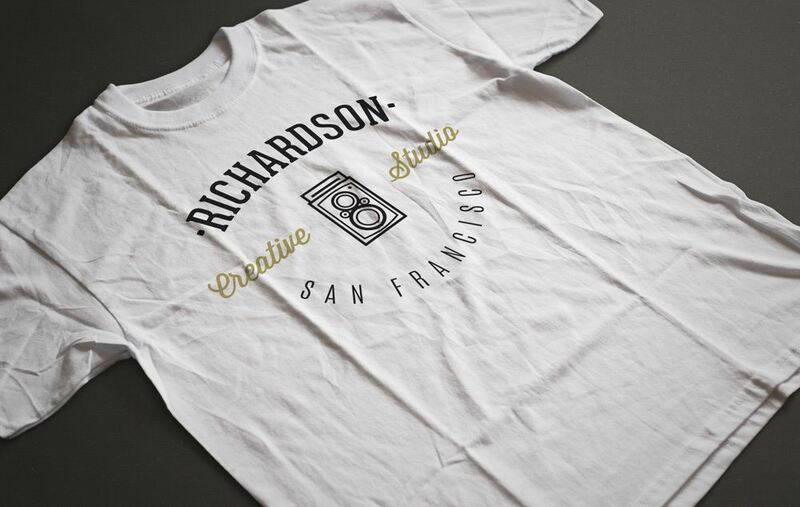 A T-shirt mockup that was crafted from scratch by the team at Pixeden. The illustrated model is refreshing when put it next to all of the other pictures. This template not only features Vector templates, but also little flat icons of T-shirts that are perfect for menu displays or mobile apps. This huge PSD file comes with over 400 elements you can fully customise. If you ever needed T-shirts, polo shirts, jumpers and more in the same template, then look no more. Cost: There’s a free version which is for personal use only and only contains 20% of the content while the commercial version has everything but will set you back $19. And for those who prefer a more realistic look, these are the mockups we recommend. Most templates are for male T-shirts, so when we see one for female garments we can’t help but feel thankful. In exchange for the file, the designers only ask for a “like”. This mockup features a T-shirt extended on a flat surface. The zip file includes the mockup and even links to the free fonts used on the fake logo. A cool looking mockup that features a male model standing in front of an urban background. This is a simple yet realistic-looking template for a blank crew-neck T-shirt. It also comes with a video for those who are new with T-shirt templates. Go Media shares with us several colourful templates for those who like an overall print. The one that stands out is the vest for women because it’s not so easy to find. Dealjumbo.com has a great freebie hidden there on its packed website: some free T-shirt templates. Here’s a PSD file of a mockup that uses smart objects. With this one, you’ll save time for sure. This PSD file contains a photorealistic representation of a T-shirt hanging from a wooden hanger in both front and back versions. Cost: Free after you subscribe. Dealjumbo.com offers a pack of ‘4 in 1’ mockup. It consists of four different pictures of male models wearing T-shirts that you can modify to your liking. All you have to do is sign up. Cost: Free, but you have to give them a valid email account. This second version of their women’s T-shirt template comes with high-quality images of both front and back. This template by Pixeden comes in a high resolution, which makes it great for showcasing details. It also comes with a smart layer to facilitate the process of applying the design. This template was originally created for a contest organised by Dribble, but you can still download it if as long it is for personal use. A unisex mockup that allows you to customise colour and design however you see fit. Don’t forget to credit and add a link to their website when you use it. This PSD file brought to you by Zippy Pixels has not only one, but two mockups. The T-shirts are presented in different perspectives so you can put together a persuasive presentation. Cost: Free as long as you fill in a valid email address. This professional looking template has a small detail that makes the difference. Can you see it? It’s the tag! It might seem silly, but it does make it stand out. Showcase your design for female garments in this beautiful mockup by Pixeden. A set containing two mockups of a folded T-shirt. The PSD (3800 x 2900 px) is fully layered and comes with a smart object. A mockup of a high-res shot (5000 x 3333 px) of a folded T-shirt. Change anything from the artwork to the background. This free download features a front and back side over a wooden background. Use the smart layers to apply your design. Pixeden presents us with another T-shirt template for your creations. This time is a classic crew neck tee. This PSD file allows you to change the background, colour and artwork. The dimensions are 4500 x 2834 px. This template featured in Free Goodies for Designers was made (according to its designer) as a response to the lack of colourful T-shirt templates out there. You can either download it for free or give a donation of $0.90 to its creator. Another mockup by graphicburger.com, this one is for men apparel. The PSD file includes realistic textures, folds displacement mapping and filter actions. This long T-shirt template offers a nice break from the short sleeved ones. This one comes with a model and both front and back sides. In case the black T-shirt wasn’t enough, Freepik also features this mockup that contains both a black and white tee. In case a white T-shirt is all you need, Freepik also features this simple white T-shirt template. Lovers of the vintage style, this is the mockup for you. On top of the unique silhouette, this template has a layer that will allow your design to perfectly adapt to the creases on the garment. This template is based on a photo and comes in five different colours. This mockup is brought to you by Cristian Doru, the man behind ThisLooksGreat.net. As he warns “don’t be fooled by how simple it looks”. This Brazilian designer presents a very special mockup for just labels! The masked layers allow you to adapt any logo for a realistic finish. A great-looking polo mockup. You’ll need to create a premium account pixeden.com in order to download this one. This one is a bit different. The template features a model wearing a tee with the latest Superman logo on it. You can get a Free version or a premium one for $3,00. Cost: Free or $3,00, depending on the version. Phlearn is a platform with hours of Lightroom and Photoshop tutorials. One of those is a T-shirt template video which comes with its own downloadable file. Cost: In order to download the file you’ll have to join Phlearn which costs $8.25 monthly. Cost: You have to create an account, which costs $6 monthly. This one is a bit on the pricey side, but you’ll get an eight-in-one package. The file includes front and back sides, flat and “ghosted” versions of the garments, clipping masks in place and realistic lights, shadows and shading effects. Yes, there are a lot of templates.